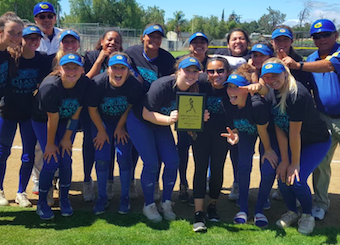 The Foothillers rallied from a 3-2 deficit on a full count grand slam by Aly Allman which scored Kimmy Bond, Jordan Brown and Jamie Medlin in the bottom of the fifth inning. Things started in the bottom of the first inning for Grossmont when Kati Contreras blasted a two run homer that scored Bond who singled to lead 2-0. San Pasqual would tie the game at 2-2 in the top of the second inning on a passed ball. They would eventually take a 3-2 lead in the top of the fifth when Annie Villalobos singled to center field. For Grossmont in the circle, Samaria Roope went the full 7 innings for the complete game victory giving up three runs on eight hits while striking out four and walking zero. On the day the Foothillers smashed two homeruns. Contreras went deep in the first inning and joining her was Allmann who went deep in the fifth inning. On the day in victory, the Foothillers had 7 hits with both Bond and Allmann with multiple hits. Bond went 3-4 with 2 runs and a double while Allmann went 2-3 with a run and four RBI’s with a grand slam. A four-run fourth inning helps procure the semi-finals victory for the Foothillers over the Bulldogs. Ramona drew first blood in the top of the fourth when Seneca Curo roped a double that scored Alexa Neil to make it 1-0. However, the Foothillers answered right back in the bottom of the inning with a run of their own thanks to Aly Allman (1-3, RBI) reaching on an error that scored Kimmy Bond (2-4, 2R, RBI) who led off the inning with a bunt single. With the score tied at 1-1, Grossmont in the bottom of the fourth opened the gates as Jessica Medlin (1-2) led off with a single, Brianna Blue (RUN) in to run, a couple batters later Katie Appenzeller (1-4, R) laced a single and Bond drove in Blue on a single. The next batter Kati Contreras (2-3, R, RBI) singled which scored Bond and Appenzeller was able to score on a Bulldog error. The final run came on a smash triple by Samaria Roope (1-2, RBI, 3B) that scored Contreras. Roope only allowed a single in the top of the seventh before shutting down the Bulldogs to end the contest. In the win, rope tossed a 7 inning complete game giving up 1 run which was earned on 4 hits while walking 0 and striking out 7. The Golden Eagles took an early 2-0 lead on an Annie Villalobos homerun in the bottom of the first inning and never looked back. Another opportunity presented itself for the Sultans in the top of the fourth with one out as Krysten Service reached on an error, Madison Mendez smashed a double and Bennett was intentionally walked to load the bases. However, Madrigal hit a liner that was caught and thrown to first to get the third out to end the threat. Santana just couldn’t get the timely hit as again in the fifth inning Joey Barkhimer and Lakaila Aquiningnoc singled back-to-back, Holmquist singled but Barkhimer was thrown out at third and a couple batters later Emma Leggett hit into a double play. San Pasqual took advantage of their opportunity in the bottom off the fifth when Lauren Maggio doubled to score Ayiana Hernandez to make it 3-1. The Sultans pulled within 3-2 in the top of the sixth inning as Service led off with a single, she would score on an error. They would have one more opportunity in the top of the seventh as Holmquist singled as did Leggett but that would be all. On the day the Sultans outhit the Golden Eagles 10-4. In the loss for the Sultans Mendez went 6 innings giving up 3 runs of which all were earned on 4 hits while walking 2 and striking out 5.